New puzzle game Puyo Puyo Tetris doesn't only turn Tetris blocks into anime characters. It also turns them into gummies. Behold Puyo Puyo Tetris Gummi. 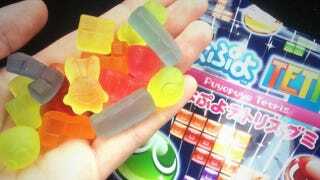 Priced at 100 yen (US$1) per bag, the snack comes with gummi shaped Puyo Puyo blobs and Tetris blocks in lemon, grape, strawberry, orange, melon and soda flavors. Puyo Puyo gummies have been around for a few years now, but these Puyo Puyo Tetris ones went on sale late this month in Japan.